Cora Felton is known as the Puzzle Lady, creator and solver of crossword puzzles. In reality, it’s her niece who does the work. Cora is just the public persona. This frequently gets her into trouble when her fans ask her help in solving a puzzle. The truth is, Cora couldn’t solve one to save her life. Peggy Dawson is an obnoxious teenager, more annoying than most in Cora’s opinion. She claims someone came into her house, went upstairs to her bedroom, and left a puzzle under her door. The police get involved, much as they try to avoid it and then Cora. Peggy didn’t bring the puzzle with her, so could Cora come to the house right now? When they arrive, the puzzle is nowhere to be seen, much to Cora’s relief. A search is suggested but Peggy’s older brother refuses to let them into his room. He looks around after they leave and discovers a bloody knife instead of the missing puzzle. Soon a dead body is found, right in the middle of Main Street. Wouldn’t you know it, the man had been stabbed. Cora has quite the history with men, having been married multiple times. Now her third ex-husband, at least as far as she remembers (she was drinking heavily at the time) has shown up. He’s always been her least favorite (she does remember that much!). He says he’s selling real estate (working a scam), but Cora is sure he’s up to much worse, and she’s soon proved right. Soon extra puzzles show up, another knife, Cora’s accused of planting evidence, and Harvey, another puzzle pro, gets involved but is afraid to be alone with Peggy. Becky the lawyer has more clients and possible conflicts of interest than any one case should have, and it looks like Cora’s cover is about to be blown. And if you’ve heard about Cora’s past exploits, you know this doesn’t begin to describe the situation. As always, Parnell Hall delivers a fast paced, laugh a minute, engrossing mystery complete with crossword puzzles to decipher on your own. Or you can do like Cora does and wait for her niece to solve them for her. This is book nineteen in the series. 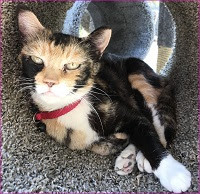 Cora is sober now, not always sure she likes it. Her talks with the police somehow let her get her way without them really understanding a word she said. Somehow, it always works out. 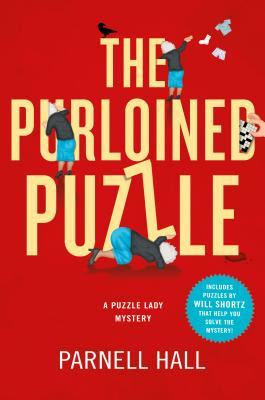 To enter to win a copy of The Purloined Puzzle, simply email KRL at krlcontests@gmail[dot]com by replacing the [dot] with a period, and with the subject line “puzzle,” or comment on this article. A winner will be chosen April 7, 2018. U.S. residents only. If entering via email please included your mailing address. Thank-you for the review. This is a new to me author. I have always loved puzzles and this book sounds delightful Thank you for the awesome review and also the giveaway. This sounds exciting - I love puzzles! Thank you for the chance to win! I love this series. Cora is quite a character. Would love to read.